Network Rail has announced a £4.1m plan to improve passengers’ journeys on routes into London Bridge and London Victoria – and boost security at railway stations in Sussex. The improvement plan will focus on passengers served by Southern, Thameslink and Gatwick Express trains and is designed to increase reliability, punctuality and the overall passenger experience of millions of passengers. The fund has been agreed with the Office of Road and Rail (ORR) and takes the place of a £2m penalty handed to Network Rail by the regulator earlier in the year for reliability and punctuality issues affecting Thameslink and Southern train services in 2014-15. Network Rail has been able to identify funds amounting to more than double the proposed fine, all of which will be invested in passenger improvements. Phil Hufton, Network Rail managing director for England and Wales, said, “Passengers expect and deserve a high standard of service and we accept that we fell short for those travelling on Southern and Thameslink services last year. 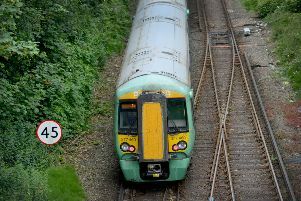 Up to four times as many security patrols at stations in Sussex to reduce delays caused by trespassers.